Although your opener has been making your daily routine incredibly convenient, you may come to take it for granted. That's ok, many homeowners do the same. When something goes wrong with it, however, you'll definitely start to appreciate how easy and effortless it used to make things. The good news are that our repair specialists can quickly return things to normal. 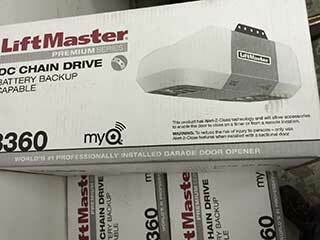 Modern garage door opener models use one of three different drive-systems. Chain-drive units are often preferred for their strength and affordability, although their high noise output does leave something to be desired. Belt-drive models are a great choice due to their silent operation. Albeit more expensive than their counterparts, if you have an attached garage then the extra cost is definitely worth it. As for screw-drive openers, their main benefits are the fact that they don't need a lot of maintenance and are also the fastest of the three. However, they aren't as silent, nor as strong. Deciding which type of opener is going to be the right choice for you requires that you account for various factors. How close your bedroom or living room is to your garage as well as the weight of your door will play a major factor. Our team can help you take everything into careful consideration. We'll also make sure that you don't neglect to look at opener models that are Smartphone compatible and have a backup battery system. This will allow you to use and monitor your door via your phone, and keep using it during a power outage. We work with name brand manufacturers like Genie, Chamberlain and LiftMaster, so any model we offer you will be of a superior quality. Unfortunately, garage door openers are not without their issues, and although newer models are very reliable, some problems or accidents can still occur. If your motor gear wore out, the safety sensors became misaligned or some part of the circuit board got fried, you can trust our team at Garage Door Repair Fort Lauderdale to quickly take care of it for you. Don't hesitate to call us today for anything you need.